River Bhima which flows through Maharashtra, Karnataka, and Telangana is renamed as Chandrabhaga when it enters Pandharpur. On its banks is the famed Vitthal Temple. It’s so called as it is shaped like a half moon. Interestingly, it’s also known as Bhiware. I googled the name but didn’t come across such a variety. “It’s a popular variety in the North Karnataka districts and I still remember my mother making kottae idli using it leaves,” said DV. Kottae Idli is prepared by putting the dough in a receptacle made of green Chandrabhaga leaves and then steamed. It is then served with a dish made of sprouted moong. It has taken more than six years for my jackfruit trees to bear fruits. I chanced upon the thumb-sized, dull green fruits which I saw hidden among the leaves. How many of them will actually become ‘fruits’ is anybody’s guess? Jackfruits do not have many takers at my home. In fact, most are unanimous that detest it due to its strong fruity aroma, thanks to its fruity aroma. I still remember Babu bringing jackfruits home: for he was fond of all kinds of fruits born as he was in Debipur, a small village in Howrah district of West Bengal, where he lived till his schooling and joined the then, Royal Indian Air Force. 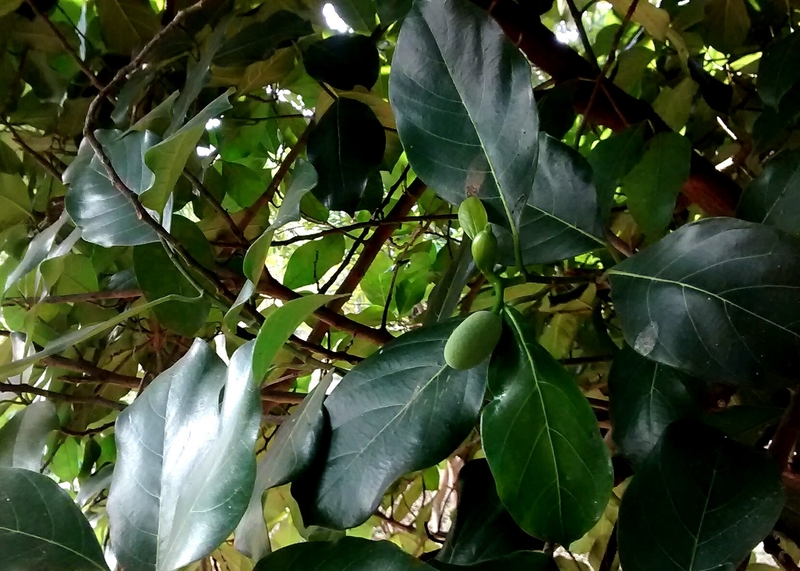 As is it in most villages in West Bengal it had all sorts of fruit bearing trees—from mangoes to jackfruits. When he retired as a ground engineer, he was considered among the best to handle the indigenously built, puny sized Gnat aircrafts, which served well during the Indo-Pak hostilities in 1965 and 1971. In fact, it was a fighter pilot flying a Gnat, from his squadron, who was posthumously awarded the IAF’s maiden Parma Vir Chakra. Babu introduced us to the world of the largest tree-borne fruit, kathal (jackfruit in Bangla), bringing it home when it appeared in the market. For us, all kathal were same but soon learnt that there were varieties like khaja kathal and moja kathal. The fruits, either eaten alone or along with rice, chappati, chira or muri. The seeds too were taken as delicacies, either boiled or roasted and eaten. Later in life I learnt of varikka and koozha from Kerala and bakke and imba from Karnataka. Lately, jackfruit has been called a “miracle” food crop because it is easy to grow, survives pests and diseases and high temperatures. Additionally, it is drought-resistant. The meat equivalent for vegetarians, jackfruit’s high potassium content helps lower elevated blood pressure, flavonoids protect against cancer and anti-oxidants fight various other ailments, including anaemia. Sri Lanka and Vietnam have established jackfruit industries, where the fruit is processed into products as diverse as flour, noodles, papad and ice cream. Jackfruit is also canned and sold as a vegetable for export. However, the same cannot be said about the fruit which originated from India. But that is likely to change, thanks to the efforts of James Joseph, a former director of Microsoft who has launched jackfruit365.com. “Once you remove the water content of the jackfruit, its 1 kg weight can be reduced to crisp and dry chola pieces that weigh 180g and fit into a ziplock packet. At the point of use they can be re-hydrated and they swell to regular bulb size,” says James whom I came to know while interviewing him on his book, God’s Own Office. Jackfruit365 operates from Aluva, where James is currently settled, and works with Amalgam, a company based in Wellington Island, to source, process, pack and supply its freeze-dried jackfruit. 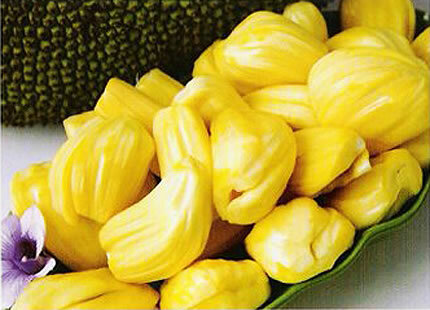 Visit the site to learn what you can make out jackfruit. Muffins, custard chunky kheer, payasam, spinach salad, kofta, quesadila ….the list is really long. “When you eat jackfruit, only your tongue should know, really, not the whole world!” concludes James. Considered a minor fruit, it’s rare to come across people who are fond of it. I consider myself in the minority for being fond of anything sweet, including jackfruit. Most of my childhood and growing-up years having being spent in air force cantonments’ my love for fruits was encouraged, thanks to my father. I still remember him reaching home in bicycle with the front handle dangling with bags full of vegetables and fruits. Come summer our kitchen had stocks of mangoes, preferably langda and dasheri, jackfruit, litchi and others. Every Sunday after the breakfast Babu would take his bicycle and leave for the market, five or six kms away and return before the noon set in. Spreading the vegetables, fruits and fish he would tell Ma how we had got the best deal. A poor bargainer, he got the best stuff, though paying a price for the same. “You’ve got to pay bit more if you want the best,” he would say. He liked his visits to the bazaar and rarely asked Ma to do the shopping. I now realize that ‘going to the bazaar’ was sort of a stress-buster for Babu though such a word had yet to enter people’s vocabulary. In fact, when we visited our grandparents in their native village in West Bengal he would take us to the haat and introduce us to the ‘wonders of a village market’ things like sweetened puffed rice, sita bhog (a sweetmeat), palm jiggery, locally grown vegetables etc. I was first introduced to jackfruits reaching to my waist. It was that big. I’m told that the size was due to the tree growing on the fertile sand of River Ganges. We had to hire the services of a man to carry it home. For a jackfruit costing Rs 10, Babu had to pay the man Rs 1 and an extra fifty paise for a packet of beedi. I still remember when the ripe jackfruit was cracked open, it was full of pods or “bulb”. We were enveloped with a mouth-watering aroma. Regularly referred to as seeds, these bulbs are actually, kinds of fleshy covering over the true seeds or pits, which are round and dark like chestnuts. We enjoyed the sunshine yellow bulbs, holding it between our fingers and ultimately spitting the seeds which were later collected. Later in the evening Ma boiled the seeds and made a bhaji of it with potatoes. They tasted like chestnut. As I grew older I came to know that jackfruit is a rich source of complex carbohydrate, dietary fiber, vitamins like A, C and certain B vitamins, and minerals like calcium, zinc, and phosphorous with high nutrition benefit in a seed. Jackfruit seed contain lignans, isoflavones, saponins, that are called phytonutrients and their health benefits are wide-ranging from anti-cancer to antihypertensive, anti-ageing, antioxidant, anti-ulcer, etc. Rich in potassium jackfruit is very functional when it comes to lowering blood pressure. You may wonder why I’m writing all this. Because my neighbouring farm owner, Vermaji, offered me a jackfruit which I brought home last Sunday. Sadly, the major part of the fruit had to be given away to friends, as my family members refused to touch it. In fact, my younger one moved to the next room and closed the door unable to bear the fruit’s smell. Didn’t I say that jackfruit doesn’t have much takers? I’m regretting the fact that I’ve ek nahin char char (Not one but four) jackfruit trees on my farm. They will fruit in a year or two. You’re all invited to pick them up.